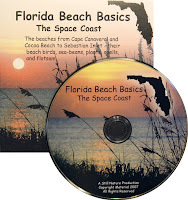 Visitors to East Central Florida will find Florida Beach Basics - The Space Coast as indispensable as sunscreen! The DVD and six UV-coated reference cards describe Brevard County’s beaches and the natural treasures to be found there. The DVD’s eight five-minute, easy-to-watch tutorials will help you find your way around, lead you to places you might otherwise miss, and tell you about the natural wonders you may see on our beaches - sea turtles, sea-beans, seashells, beach birds, plants and critters, and flotsam. The UV-coated info cards can go to the beach with you (but not in the water!). If you are in Brevard County, you can purchase the package at locations listed in the right-hand column. Otherwise, email us at StillNature@cfl.rr.com , and we'll respond with PayPal instructions. FREE SHIPPING. The following are references sources we know and use. Here comes the caveat - while we try to link only to sites that share our high standards and respect for privacy, we are not responsible for the content or the privacy practices employed by other sites. The Nature of Florida's Beaches Including Sea Beans, Laughing Gulls and Mermaids' Purses, by Cathie Katz. This charming, whimsical book with its meticulous illustrations is one of a series written and illustrated by our dearly departed friend. It’s a treasure, even if you never go to a beach. Find it at http://www.amazon.com/ or Space Coast bookstores. http://www.cccturtle.org/ The Caribbean Conservation Corporation and Sea Turtle Survival League site provides a wealth of information about sea turtles. Don’t miss the satellite-tracked turtles feature. http://www.seaturtlespacecoast.org/ The Sea Turtle Preservation Society of Brevard County is a not-for-profit organization whose mission is to educate people about marine turtles. http://www.seabean.com/ A website providing a portal to images, data, information, and contacts regarding the identification, distribution and uses for sea-beans - those true beans and other seeds and drift fruits that float with ocean currents and strand on distant beaches. The website was started by Cathie Katz in 1998 and continues due to the maintenance, support and contributions of many volunteers. http://www.nbbd.com/fly If you’re a “birder,” you’ll particularly like this site about the Space Coast Birding and Wildlife Festival held every year in late January. Gift From the Sea, by Anne Morrow Lindbergh, is a beautiful book as meaningful today as it was when it was written in 1955. If the sea and the beach are magical to you, you’ll appreciate this gentle book by the wife of Charles Lindbergh. Dr. R. Tucker Abbott authored/co-authored over 30 books on malacology. Review them at http://www.amazon.com/ or the local bookstore or library and decide just how much detail you need! Flotsametrics and the Floating World, by friend Dr. Curtis Ebbesmeyer and Eric Scigliano. "How one man's obsession with runaway sneakers and rubberr ducks revolutionized ocean science." Curt's new book (March 2009) offers some interesting insights into Curt's life and shares some of his vast knowledge about the ocean and stuff floating around in it. The Nature of Florida's Ocean Life: Including Coral Reefs, Gulf Stream, Sargasso Sea, and Sunken Ships, by Cathie Katz. Another of Cathie’s books, with her unique perspective on nature and life. There are several instances of Dr. Ebbesmeyer’s expertise on the PBS website. One of our favorites is the Wired Science, Flotsam Found video. http://www.fws.gov/merrittisland This website for the Merritt Island National Wildlife Refuge talks about the visitor information center and also gives a link to the shuttle launch schedule (remember, shuttle launches determine if the refuge is open). http://www.nasa.gov/ You can spend hours wandering around NASA’s website. This site has some of the most amazing images you will ever see. http://nbbd.com/godo/cns/ This is a great site to learn about Canaveral National Seashore, Playalinda Beach, and the Birding and Wildlife Festival. http://www.ripcurrents.noaa.gov/ A very interesting site about rip currents – explanations, animations, success stories. If you do anything other than wade in the ocean up to your ankles and then hop out, this is a good site for you to review. http://www.floridastateparks.org/sebastianinlet/ Sebastian Inlet State Park is on A1A at the far south end of Brevard County. Fishing, camping, museums, classes, the beautiful beach – this is a great place to visit. Visit Space Coast Eco for detailed directions about field trips in Brevard County - where to go, how to get there, and what to expect once you arrive. And finally, for you wildflower lovers, visit Wayne's Space Coast Wildflowers - a terrific reference site. If you are in Brevard County, you can purchase the package at locations listed below. Otherwise, email us at StillNature@cfl.rr.com , and we'll respond with PayPal instructions. FREE SHIPPING. Click on a photo of the slideshow you want to view. When the Picasa screen is displayed, click on the Full Screen option, then select the Play arrow. Our DVD is packaged in a jacket with a sticker seal instead of in a plastic DVD jewel case with shrink-wrap. The jacket is made of recycled stock, and soy ink was used to print both the jacket and the DVD label. The labels on the poly bag are removable so that you can reuse the bag for trash or treasures, and the label manufacturer is committed to environmentally friendly printing. For approved PayPal transactions, we will ship your order within two business days. Orders made by check or money order will be shipped upon receipt of payment. For delivery in Florida, 6% sales tax is added. We will not distribute any information about you or your order to any third party source.